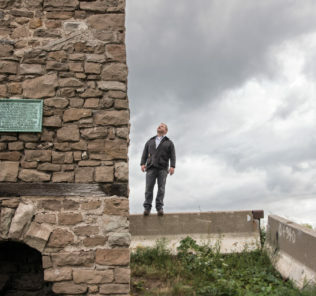 Is Niagara’s ‘Old Stone Chimney’ now crooked after relocation? The Old Stone Chimney in Niagara Falls has survived 266 years, witnessed numerous historic events, been moved three times, and now that it’s been installed in its final location — one would hope — is it now actually crooked? 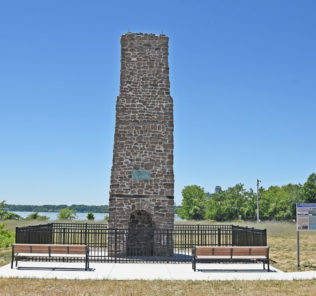 Now that the Chimney has been been installed and re-dedicated as of Monday on what’s known as the “spoils pile” — part of the modern Niagara River shoreline made of reclaimed earth from the hydro project — it has a fence, benches, preliminary signage as well as a new road from the Niagara Scenic Parkway and 10 parking spaces in a project costing $1.4 million provided by the publicly funded NYPA. But what about those who are saying The Old Stone Chimney is lopsided? 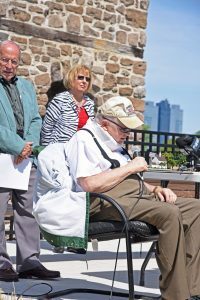 Famed local historian Paul Gromosiak attended this week’s rededication of The Old Stone Chimney and spoke about this area’s rich history. 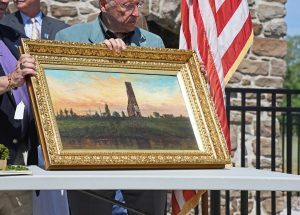 Puchalski said the Chimney’s appearance has changed many times throughout it’s 266-year existence, during which time it served first as a barracks for French soldiers and later the home of John Stedman, who’s family history is prevalent through this region. Puchalski was on hand Monday at the re-dedication ceremony to help cut the ribbon with elected area officials. Structures using the 31-foot-tall, 60-ton chimney would be burned, built up and burned down again — partly because of being located in an unfortified section of the Niagara Portage. Strategically it was vital because it was the original way — before the Erie Canal — that goods made it to the interior of the United States. Because of the geography and the massive change in elevation of the Falls region, back in the day, this was a navigational nightmare. But the Niagara Portage was the best option in a worst-case navigational scenario, and that’s why the indigenous peoples first worked for the French carrying goods, and later, rebelling against the British, sending Stedman fleeing from the “Devil’s Hole Massacre” as one of the few survivors and back to the relative safety of The Old Stone Chimney. Time moved on in Niagara, and its industrialization encroached upon The Old Stone Chimney. One of the old Carborundum buildings on Buffalo Ave. — which before the hydro project was roughly the original shoreline of the Niagara River — was built right up against the Chimney. It was eventually moved brick by brick to another location not too far away, and later, that site became untenable as well due to industrial needs. 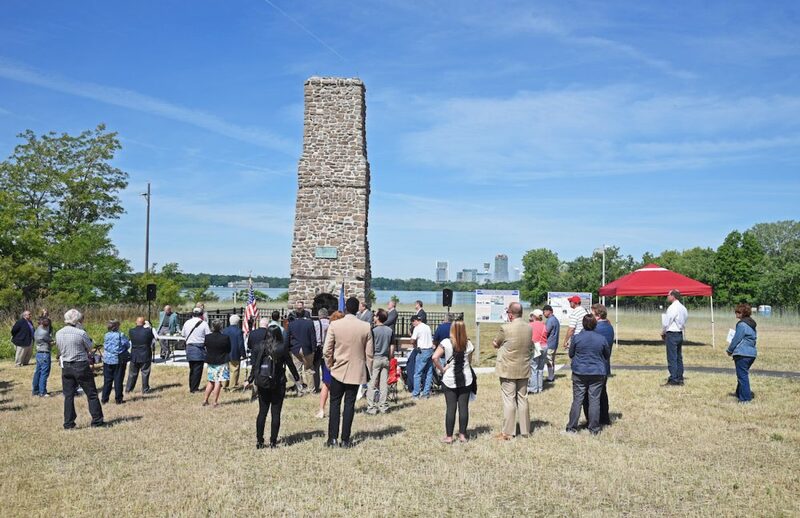 In 1942, the Old Stone Chimney was moved to Porter Park, where it eventually sank into sad obscurity for decades after the Robert Moses Parkway cut it off from the river, where it stood usually not accompanied by a structure. canvas. It was unveiled to the public for the first time at Monday’s rededication ceremony. When Puchalski and the Niagara Portage Old Guard took up the torch as protectors and boosters of the Chimney several years earlier — preceded by many years of research by famed local historian Paul Gromosiak, who was also on hand Monday — it was completely covered by trees and brush as it ingloriously abutted into the side of the parkway. Some upkeep and a lot of outreach followed until suddenly the Robert Moses reconfiguration project put the re-discovered Chimney in danger of being toppled during construction. In a storm of questions and scenarios, a plan was engineered by NYPA to move the Chimney to the spoils pile near the Adams Slip where the tugboats are kept. And despite the Chimney never actually being moved throughout the entire construction project — it was protected by a pen of concrete highway dividers as well as it’s newfound public awareness — once again The Old Stone Chimney stood tall. Disassembled during Fall 2015, it appeared brick by brick, foot by foot on the spoils pile site during the unusually warm December of that same year. Besides the somewhat lopsided look of the Chimney at its new location, some questioned why dumpsters at the Buffalo Avenue location were seen filled with rock, seemingly from the chimney. Had it been damaged? Panepinto said it was “fill rock” from the center of the chimney helped used to support it and that it had to be broken to free the rest of the stones. Historically it was not significant, he said. Panepinto also said he’d be looking into what’s going on with the angle of the chimney. Like Puchalski said, the chimney’s appearance has changed throughout the years, but its meaning hasn’t. That is, the importance of the Niagara River to the region, where the second-oldest structure in New York State stands alone — once again — as it often did during its history.